Sometime between 1691 and 1696 Isaac THEVELIN and Elizabeth DOSSELART moved to Canterbury from Cadzand. This statement is based on the birthdate of Jacob who was born in Canterbury on 23 Dec 1696. The only information is IGI record with no source quoted. 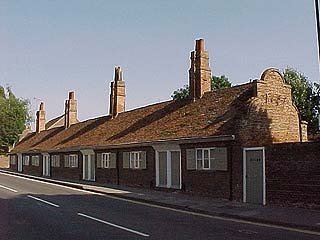 Jesus Hospital (an almshouse) was built in 1599. 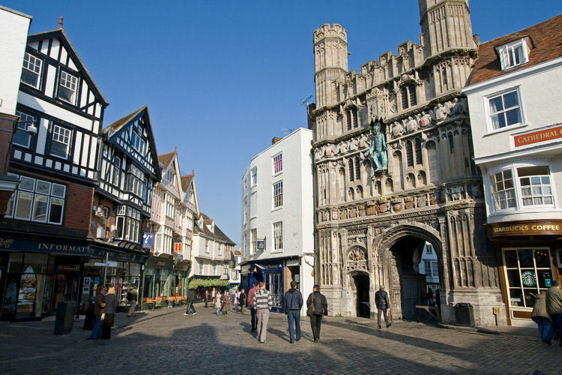 By the 17th century, Canterbury's population was 5,000; of whom 2,000 were French-speaking Protestant Huguenots, who had begun fleeing persecution and war in the Spanish Netherlands in the mid-16th century. The Huguenots introduced silk weaving into the city, which by 1676 had outstripped wool weaving. Click below the old engraved map of Canterbury to see a collection of some excellent pictures of old Canterbury buildings by Stephen Bax a lecturer at Canterbury Christ Church University College in the Language Studies Department. At the end of the 17th century, when Isaac and Elizabeth arrived, the travel writer Celia Fiennes said that Canterbury was a flourishing town. She described it as a noble city with handsome and neat buildings. Most of them were made of brick. Read more in http://www.localhistories.org/canterbury.html "A Brief History of Canterbury" written by Tim Lambert. In the 18th century Canterbury dwindled to being a quiet market town although it did have a leather industry and a paper making industry. An interesting and detailed description of the city in the 18th Century can be found in a survey by Edward Hasted published in 1800 and found at British History Online. The Wikipedia article on Canterbury covers this period and continues the history of Canterbury up to the present day. On a recent visit to Canterbury I found a well ordered, happy and bustling town. As an undergraduate, nearly fifty five years ago, good heavens!, it was my local town. I wined my prospects there. ("....and a bottle of Graves please waiter") very close to the Marlow Theatre. Of course this time I saw it as a tourist, but that industry was tastefully subdued; not overpowering as it is in York. Everywhere is well signposted. One soon becomes accustomed to the warren of winding streets and learns the etiquette for navigating them confidently by car. Peter Collinson's "Canterbury Tour Map" - http://www.hillside.co.uk/tour/map.html offers many views over the years from a clickable map.